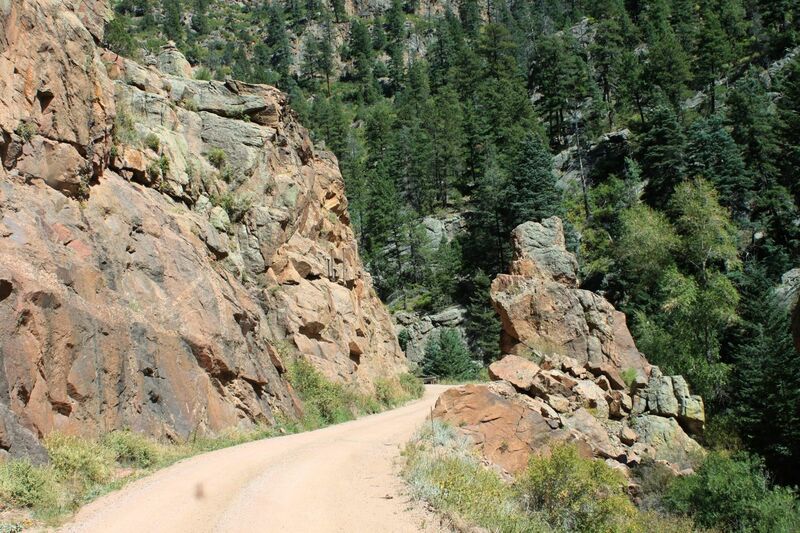 Phantom Canyon Road is an old railroad grade dating back to 1894. It once connected the gold-mining towns of Cripple Creek and Victor (Teller County) to Florence (Fremont County). It is arguably the most scenic part of the Gold Belt Scenic Byway. Ghosts from the past reportedly still roam the canyon, making it a fine place for camping with a twist! The canyon got its name in the late 1800s when some train passengers claimed to have seen walking along the tracks the ghost of a prisoner, a man who had been executed in the Colorado State Penitentiary a few days earlier. The route is dotted with ghost towns like Adelaide, Wilbur, and Alta Vista, which were washed away in devastating floods or abandoned when the railroad closed in 1912. What little is left of the ghost towns is now mostly on private land, though some traces can be seen from the road. The road also boasts two iconic tunnels and one of the original railroad steel bridges. It is possible to access a less-traveled hiking trail to the Beaver Creek State Wildlife Area from this bridge. 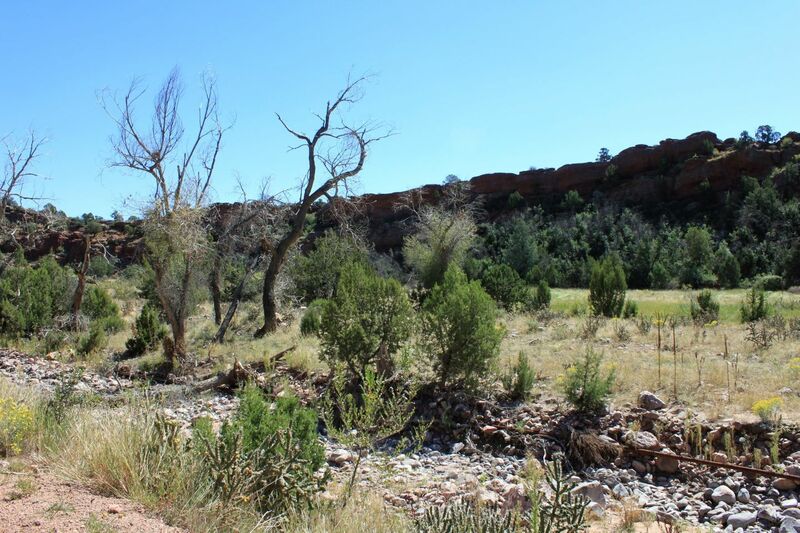 The gravel section of Phantom Canyon Road starts where Eightmile Creek enters the canyon. The road here is very wide and flat. There is plenty of room to pull off if you need to get organized before the start of the trip. Want to see 15 more waypoints? Become an All-Access member! Phantom Canyon Road can be taken from both ends, Penrose (Cañon City) or Victor. The route described here starts in Penrose, at a lower elevation. From US-50, 5 miles east of Cañon City, turn north at the intersection with Phantom Canyon Road (CR-67) and continue about 4 miles to where the pavement ends. This is your starting point. Note that CR-67 becomes CR-86 in Teller County. Caren, whose name rhymes with "car," moved to Colorado in 2006 from Rome, Italy, and immediately fell in love with its nature and distinctly Western spirit and lifestyle. He put 250,000 miles on his first 4x4 vehicle, a used Dodge Durango, traveling all over the state and visiting neighboring Utah, Wyoming, Arizona, and New Mexico. When his faithful Durango finally gave up in a snowstorm after heroically getting him, Sebastian the Cat, and Taos the Happy Pup to his doorstep in Denver from Edwards, CO, he decided to buy a Jeep Wrangler so he could continue exploring the trails and "discovering" new areas. He often travels in the company of Taos, his adopted Australian Shepherd, which he's named after his beloved town south of the state line. In Italy, Caren was a freelance journalist, writing on a range of topics including travel, culture, and wine and food, as well as a reporter for several U.S. and Italian publications, among which The Hollywood Reporter and Il Riformista. He is the co-author of 'Rome,' published by Everyman in the U.S. and the Italian Automobile Club in Italy, and the first edition of 'Time Out Florence,' published by Penguin Books. 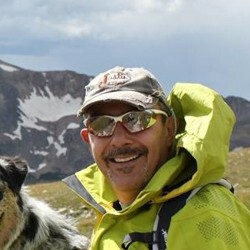 He currently teaches Italian and spends most of his free time skiing, snowshoeing, hiking (he's hiked the Grand Canyon rim-to-rim in 13 hours nonstop), camping, horseback riding, and exploring Colorado and the Southwest. I drove Phantom Canyon Road on Friday, February 22nd. The road had been graded/snow plowed, so there was little snow on the road itself (most in spots shaded by mountains or trees). This is a beautiful drive, so take your time and stop frequently to view the panorama. Fun little road, did it in 2WD just dirt/gravel mix. Great camping spots pretty much anywhere you go though there's a few areas where you see "No Trespassing Signs" and then campgrounds as well. We did the trail from Canyon City to the HWY 67 (South to North.) Lots of campers in about the first 2 miles, pretty sparse after that. Creekbeds were dry with the exception of a few places (and those were loaded with trout I didn't have the heart to catch since they're trying to survive the drought) but overall excellent day to be alive and free in 'Merica. Where the red steel bridge is is your indicator that there is amazing photography opportunity (Waypoint 10-12) available with small rocks along the side you should scramble. Thanks for all the information on this little road, I love this site! Great Sunday drive for the family when you need to get out of the house and do something. The road was wide open and very accessible, but be aware of on-coming traffic when approaching corners and both of the tunnels. The rock formations are amazing and well worth the drive. Very easy and absolutely non-technical drive that any stock vehicle can do. Most of the vehicles we encountered were minivans from Missouri, good times. The fall colors were still out but not as vibrant as probably a week earlier. The trail itself is in good shape, lots of traffic with people out to see the fall colors. The trail can be done in just about any type of vehicle the main issues only being washboard sections along the trail. The group I was with, we ran the trail from Victor to Canyon City but it can be ran in either direction. Several narrow areas that you need to watch out for on coming traffic as only one vehicle can get through at a time, especially the two tunnels. Overall a nice trail to run especially in the fall to see the leaves.